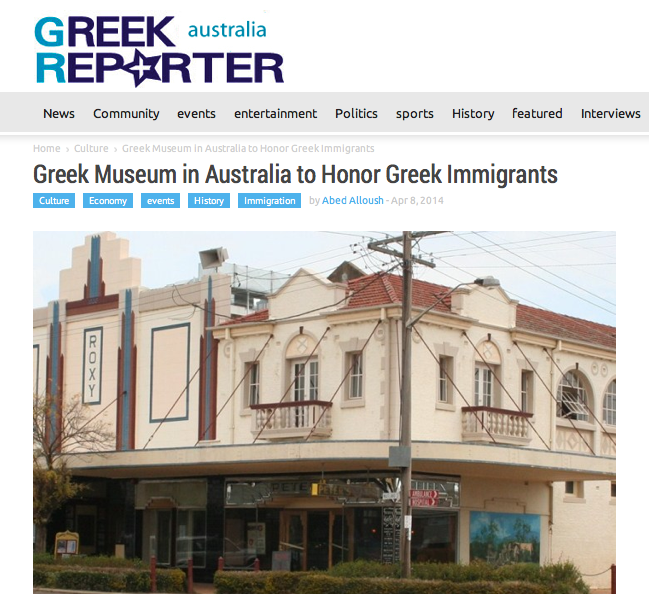 The article GREEK MUSEUM IN AUSTRALIA TO HONOR GREEK IMMIGRANTS was published 8 April 2014 in the GreekReporter - Australia, authored by Abed Alloush. Bingara, a small town in the New England region of New South Wales, Australia - about a seven hour drive away from Sidney and a four hour road drive from Brisbane - now hosts the Roxy Museum. The Roxy Museum, built to give visitors a journey of the life and developments of the Greeks who immigrated to the village, finally opened it's doors on April 5. It is the final jewel of the Roxy Theatre complex and the last chapter of restoration of a truly great Greek Australian landmark. It is a landmark that restores the Greek-Australian history of the village in a remarkable way. The village is connected with the history of the Greek immigrants that came to Australia seeking a better future. In particular, the Greek immigrants managed to become an integral part of Bingara's economy due to the cafes that they have built in the area. This became something like an institution for the Australians, known as "Greek country cafe." Peter Feros, George Psaltis and Emanuel Aroney, are the Greeks that opened the first cafe in the village. In March 1936, the three partners inaugurated the original Roxy Theatre, and entertainment complex without equal in the region.